How can real world evidence (RWE) improve the drug development pathway, from discovery to approval, and boost access to treatment? What are the challenges and barriers to using this data to guide reimbursement and design patient access schemes? The UK is leading the way, particularly in oncology, but challenges exist, not least the need for high-quality, accessible, confidential data. 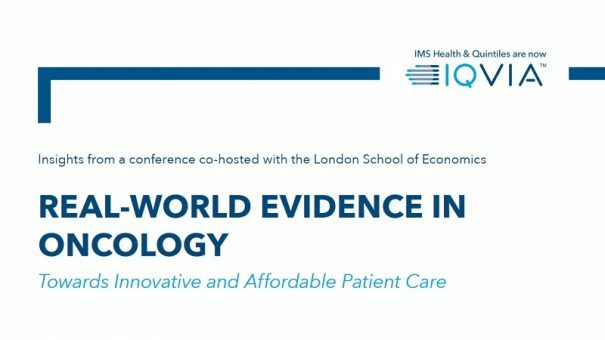 As we stand “on the cusp of something great”, IQVIA and the London School of Economics and Political Science hosted a meeting entitled Real-World Evidence in Oncology: Towards Innovative and Affordable Care to answer these and many more questions. Held in London, it brought together experts from across the sector, including representatives from advocacy groups, Public Health England and NICE. Based on the learnings, this conference report event explains who are currently using RWE, what the future might hold and how to overcome the many challenges.